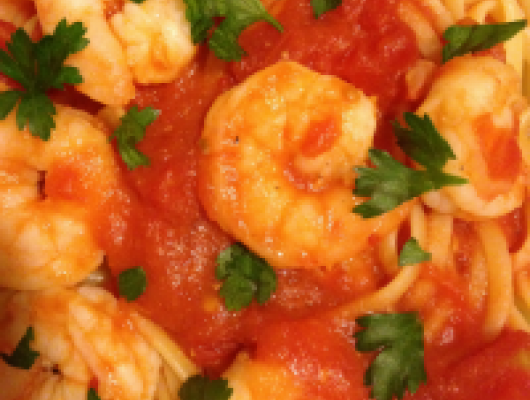 To prepare this dish, you will need to start by boiling a pot of water for the pasta. Add the pasta and cook according to package. While the pasta is cooking, add butter and the extra virgin olive oil in a sauce pan. Add the shallots and garlic and sauté for about 3-4 minutes. Season the shrimp with salt, pepper and red pepper flakes. Add the shrimp to the sauce pan and cook them for about 2-3 minutes or until pink. Add the wine and bring to a boil. Add the tomato puree and lower the heat to medium to low heat for about about 10 minutes. If the sauce gets too thin, add 1-2 Tablespoons of flour to thicken it up. Once done, place the pasta on a plate, pour the sauce on top of the pasta and sprinkle the chopped parsley. Serve immediately. 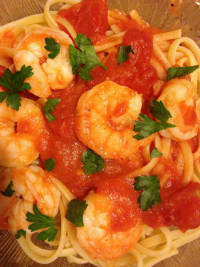 Quick and easy Shrimp with Linguine recipe. Very flavorful and super easy to make. Its perfect for those busy weeknights!